If you think you have found a bug in Sherpa which is not shown here, please submit a ticket to the CXC Helpdesk describing the problem. An active list of development issues can also be found on Sherpa GitHub site. CIAO includes IPython in the CIAO OTS directory which is used by Sherpa and ChIPS to provide command-line user interfaces. These programs create an IPython profile in the directory $HOME/.ipython-ciao/. If IPython users want any personal customizations to be available when running CIAO, they will have to copy them from $HOME/.ipython/ to $HOME/.ipython-ciao/. The location of the IPython profiles has been changed from $HOME/.ipython-ciao45/ to $HOME/.ipython-ciao/. User files in current working directory may conflict with Python DS9 interface. Files with single character names "a" through "y" in the current working directory may conflict with the Python DS9 interface used in Sherpa, preventing 2D data loaded into a Sherpa session from being displayed in DS9 with Sherpa commands such as image_data. Trying to do so will yield an error, "DS9Err: Could not display image." Simply removing the offending file(s) from the current working directory will resolve the issue and restore the ability to plot in DS9 from within the Sherpa session. RMF and ARF energy range must be the same. If an RMF and ARF with different energy ranges are assigned to a data set in Sherpa, Sherpa will print an error message when trying to	fit the data: ValueError: RMF data is invalid or inconsistent. See the CIAO Imaging Spectroscopy threads to learn how to create an ARF and RMF with the same energy range. set_psf should not be used when a PSF model has been applied manually. The Sherpa set_full_model functionality provides users with the flexibility to define model expressions that apply instrument responses or PSFs to some model components, while not applying the response or the PSF to other model components in the model expression. When a PSF has been applied to a model expression in this way - e.g., "set_full_model(psf1(gauss2d.g1) + beta2d.b1+const2d.c1)"- it is not necessary to apply the PSF with set_psf in the usual way when defining model expressions automatically with set_model; doing so will erroneously apply the PSF twice in the final model expression used for fitting. User-specified PSF 'origin' position is off by 1 pixel in x and y directions. If the user chooses to set the optional, hidden 'origin' parameter of a PSF model to the	(x,y) coordinates of a chosen pixel in that kernel, the position should be decremented by one in both x and y directions. For example, if DS9 was used to find that the brightest pixel is at (122, 131), 'psf.origin' should be set equal to '(121, 130)'. This is necessary because Sherpa internally stores data, PSF, and kernel information as NumPy arrays - which start counting from element 0 - whereas DS9 uses pixel coordinates, with the first pixel having a value of (1,1). If psf.origin is not set by the user - leaving Sherpa to automatically locate the position of the brightest pixel in the kernel and set this as the origin - Sherpa will find the correct location, provided that a) the brightest pixel should coincide with the origin in the analysis, and b) that there is only one pixel that has that brightest value. PSF Images must have even-numbered axis lengths. Caveat: PSF images should have axis lengths with even number of pixel. An odd number of pixels may result in the data being fitted to appear to be shifted by 1 pixel in either direction. Image fitting in sherpa should only be done in either physical or image (logical) coordinates. Sherpa does not take size of pixels into account when set_coord is used to change to world (wcs). Here a 2D Gaussian with a FWHM=0.01 pixel is created. When the Gaussian is center on the pixel center, the sum of the model is 1.0. However, shifting the narrow Gaussian by a small amount, 0.1 pixels in the X direction, results in the model now essentially summing to 0. This leads to very steep slopes in the error surface separated by large areas where the fit statistic barely changes with positon. The error surface looks like a stair case rather than say the classic parabolic shape. Here the same data are loaded as both the dataset and the PSF. A 2D Gaussian is used to approximate a delta function and the data are fit. Trying to run conf will yeild tiny errors on the xpos and ypos values. 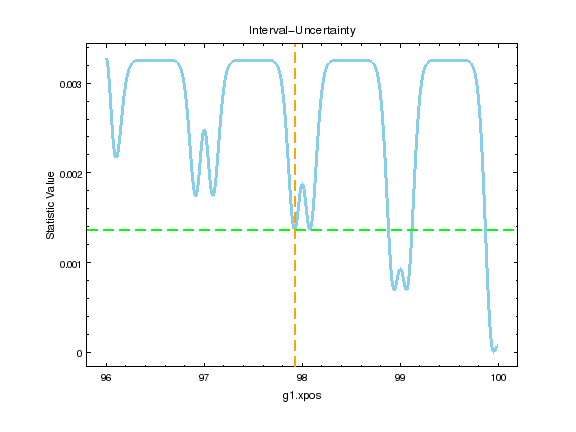 It is best to look at the error surface using int_unc. The stair-step error surface is a result of the Gaussian only being evaluated at the pixel center. The large region between the pixels is when the model evaluates to approximately zero. This is not restricted just to Gaussians. All 2D models behave the same way.